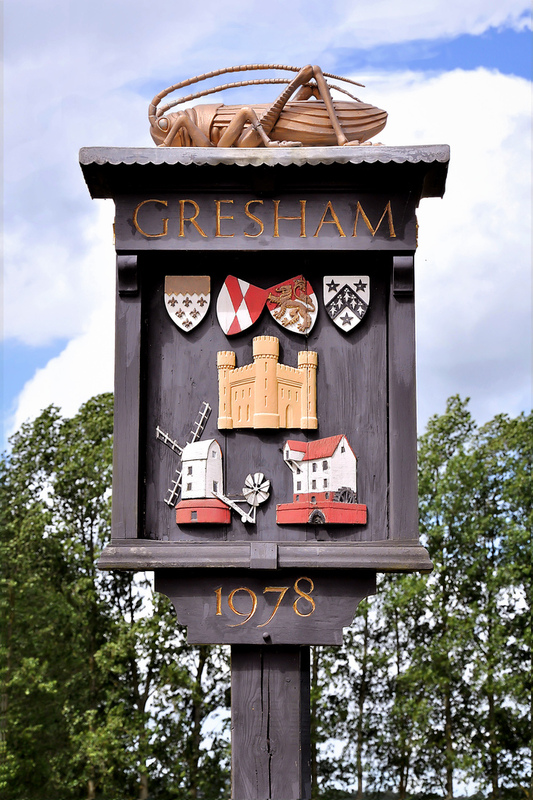 Gresham is a village and civil parish in North Norfolk, England, five miles (8 km) south-west of Cromer. A predominantly rural parish, Gresham centres on its medieval church of All Saints. The village also once had a square 14th century castle, a watermill and a windmill. The moat and some ruins of the castle survive. The name of Gresham is derived from a local stream known as the Gur Beck, plus -ham, meaning a settlement. In the Domesday Book of 1086, Gresham is recorded as one of the holdings of William de Warenne, 1st Earl of Surrey. The parish church of All Saints is one of 124 round-tower churches in Norfolk. It was built on a pagan site and contains one of the East Anglian seven sacrament fonts, in which there is much interest. Scenes represented on it include a baptism, a holy eucharist, and parishioners clustering around a neighbour's deathbed. The remains of a fortified house called Gresham Castle are near the village, opposite the pub. It is thought to have been similar to the neighbouring Baconsthorpe Castle, and both were moated. The cache is not very near the village sign as someone inconveniently built a church there and now there's a CM nearby!!! Please do not go climbing all over the sign! To find the cache look at the base of the sign with your back to the church. How many WHOLE bricks are in the top course of the base side nearest you. This is A. There is a creature on top of the sign; how many legs does it have? This is B. There is a bench behind you against the church wall. How many years was winnie a friend of the village? This is CD.